The Simple Cabin structural assembly showing posts, girts, joists, and rafters. After sizing the poles, it is now possible to size other structural elements, such as the girts. There are seven girts. The top girt, three loft level girts, and three first level girts. The top girt holds 16,963 pounds, the two outside loft-level-girts carry 33,926 pounds each, while the inside loft-level-girt carries 16,963 pounds, and the three first-floor-girts carry 16,963 pounds each. 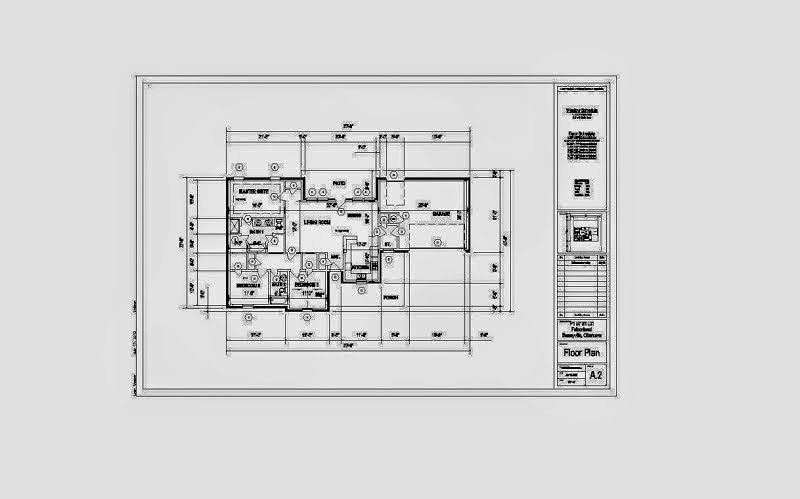 The National Forest Products Association provides wood structural design data. The safe load for a single 12" x 12" beam spaced twelve feet apart is 16,898 pounds. Since my beams are spaced ten feet apart, I can assume a 12" x 12" beam would suffice. Except for the two outside loft-level-girts. They carry 33,926 pounds each, and there is no beam specified in the National Forest Products Association wood design table. The problem here has an easy solution. Double up the girts. A double 2" x 12" that is well spiked together has slightly more than double the load bearing strength of a single 2" x 12" beam. Since a 12" x 12" beam that spans 10 feet can carry 20,278 pounds, I only need to compensate for 13,648 pounds. I could spike five 2" x 12" beams onto the 12" x 12" beam, and therefore meet the load requirements. This solution is not very efficient, and a single glulam or structural steel would carry the weight easier. If I wished to use only 2" x 12" beams, then I could make beams of five 2" x 12" spiked together, and place them independently on opposite sides of the poles. This assumes I use finished, dimensional lumber purchased from a lumber yard. I plan on milling my own lumber, so I can create 5" x 12" beams to spike into a girt assembly. This solution is simpler, and more efficient. Now that I have the girt sizes, I can size the joists and rafters. Again the National Forest Products Association provides an easy table for sizing joists and rafters. 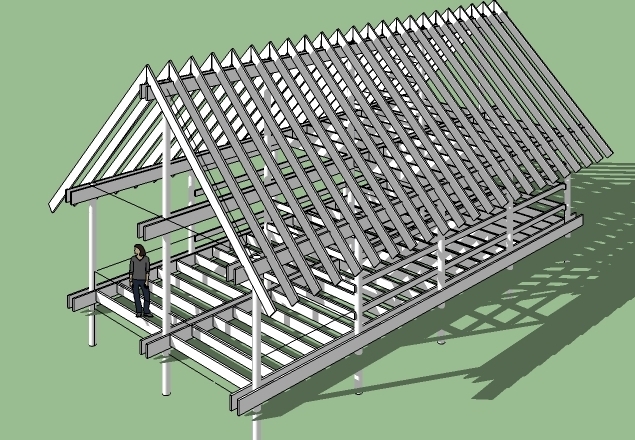 I can use 2" x 8" joists for the first floor, and the loft floor, and they can be place 24" apart. The table sets the span limit at 10'-2", so I am well within the design guidelines because the span is only ten feet, and the girts will decrease the span even more. The table again suggests a 2" x 10" rafter placed twenty four inches apart is necessary because the horizontal span is 13'. The entire rafter could be purchased as a single element, but it is yet to be determined where I will acquire the structural rafters. With the pole selection, girt selection, joist and rafter selection, I have specified the most important structural elements for the cabin. If I get it wrong it could fall down, but given the meaty beams specified, I don't think it is likely. The construction quality must be sufficient though. I have the basics for the Simple Cabin, and I am enthusiastic about starting the project. I will certainly need help in the future, so volunteers apply within! If you have any ideas or suggestions on how to improve the design, then leave a comment below.